Lebanon finally has a new president. Lawmakers threw their support behind Michel Aoun, a strong Hizbullah ally, to fill the country’s long-vacant presidency. The parliament convened at noon Monday for the voting session in its 46th attempt to elect a head of state. Aoun was elected after four rounds of voting during the session. Immediately after the results were announced, celebrations were in areas across Lebanon after elected Aoun. 1933: Born in the municipality of Haret Hreik, a southern suburb of Beirut. 1955: Graduates from College Des Frères Secondary School in Furn al-Shubbak. 1958: Graduates from Military Academy with the rank of first lieutenant specializing in artillery divisions. Sept. 22, 1988: Parliament failed to elect a successor. Outgoing President Amine Gemayel dismissed the government and appointed a six-member interim military government headed by Aoun. August 1991: Is exiled to France after spending months taking shelter at the French Embassy in Beirut. May 7, 2005: Returns to Lebanon a few weeks after Syrian withdrawal. Feb. 5, 2006: Signed a Memorandum of Understanding with Hizbullah Secretary General His Eminence Sayyed Hasan Nasrallah in the Mar Mikhael Church in Chiyah. 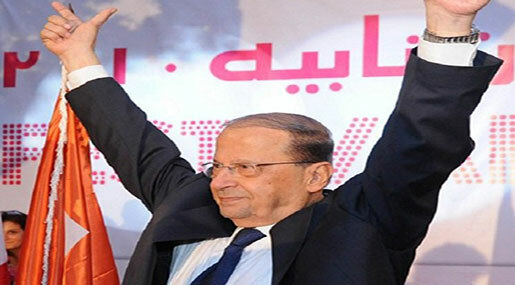 Aoun joins March 8 coalition. July 2006: Supports Hizbullah in the July “Israeli” war on Lebanon. 2008: FPM joins Cabinet for the first time, represented by three ministers. May 2008: Takes part in Doha Accords which result in election of Michel Sleiman as president. May 2009: FPM wins 27 seats in Parliament, participates in new Cabinet with five ministers. Dec. 10, 2009: Visits Syrian President Bashar Assad for the first time. January 2011: Aoun topples Hariri Cabinet along with March 8 allies. 2011: Aoun voices support for Syrian regime following uprising. January 2014: Aoun holds talks with former Prime Minister Saad Hariri but to no result. May 2014: Michel Sleiman’s term ends. Aoun announces candidacy. 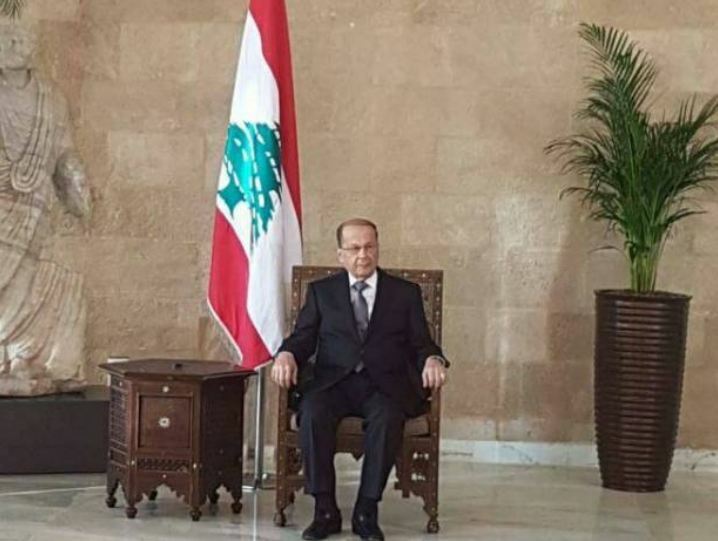 January 2016: Aoun and Geagea convene in historic reconciliation dubbed Maarab Agreement. Geagea nominates Aoun for presidency. September 2016: Hariri’s Chief of Staff Nader Hariri and FPM President Gebran Bassil reach an understanding to nominate Aoun. Oct. 20, 2016: Hariri formally endorses Aoun for the presidency. BEIRUT-Lebanese Parliament members on Monday elected MP General Michel Aoun President of Lebanon, ending a two and a half year-power vacuum, according to al-Manar website. 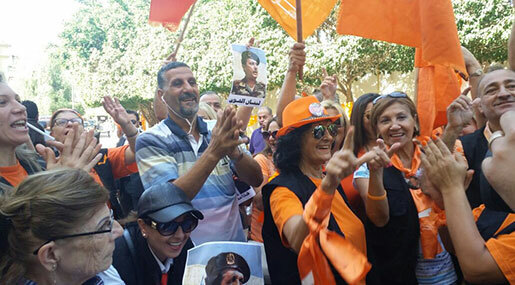 The head of Free Patriotic Movement was elected in a second round during a Parliamentary session. In the first round, a quorum of two-thirds majority of the 128-parliament was not secured. Aoun won 84 votes, while there were 36 white ballots and 7 others. A second round took place at the Parliament, where Aoun secured 83 votes, and there were 36 white ballots and 8 others. 83 votes were enough to secure a 50 percent plus one quorum in the second round. In addition to Lebanese MPs and ministers, the election session was attended by diplomats and dignitaries from across the world. Following his election, the session attendees erupted into applause, welcoming the new president. Lebanon has been without a head of state since former President Michel Sleiman’s term ended in May 2014, without an agreement on a replacement. Aoun has been a running candidate from the beginning, backed by Hezbollah, who repeatedly reiterated that the 81-year-old veteran Christian leader is qualified for such post.